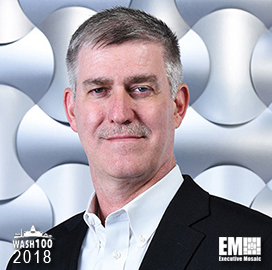 Executive Mosaic is pleased to introduce Terry Hagen, president of aerospace and technology at Jacobs Engineering Group, as the newest inductee into Wash100 — Executive Mosaic’s annual selection of the most influential voices in the government contracting arena–for his guiding principles in the aerospace and defense marketplace as evidenced after he helped spearhead the company’s purchase of CH2M last year. Hagen oversees the technical and professional services contractor’s aerospace and technology business with more than $2.5 billion in annual revenue and that provides services to the defense, aerospace and nuclear industries. Jacobs made major gains in acquisitions last year, including that of the $3.27 billion purchase of CH2M through a cash-and-stock transaction in a move to establish a $15 billion combined firm that will provide infrastructure and professional services to government and commercial clients. Following the completion of the transaction, Hagen was named head of the aerospace, technology, environmental and nuclear business–one of the three business lines Jacobs formed in an effort to streamline its operating model. Jacobs also secured a potential $771.3 million task order from the U.S. Special Operations Command for enterprise operations and maintenance services and a potential $480 million contract to provide test, evaluation and certification support to the Defense Information Systems Agency. “Jacobs has a long history of providing support to Department of Defense communities for more than 70 years, and this win provides an opportunity to showcase our advanced IT services,” Hagen said then. He joined Jacobs in 1987 and has held senior leadership roles since then such as executive vice president of global sales and marketing, senior VP for process sales and group VP for mining and minerals. Hagen served for more than a decade in the Air National Guard as a commissioned civil engineering staff officer. Executive Mosaic congratulates Terry Hagen and the Jacobs team for their selection to receive this award.